JMMT is the official membership peer journal of The McKenzie Institute International and its branches. Don't miss the next issue - become a member of your branch today and ask your administrator for subscription rules! 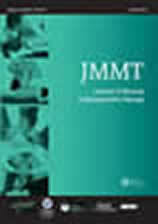 JMMT is an international peer-reviewed journal dedicated to the publication of original research, case reports, and reviews of the literature that contribute to the advancement of knowledge in the field of manual therapy, clinical research, therapeutic practice, and academic training. In addition, each issue features an editorial written by the editor or a guest editor, media reviews, thesis reviews, and abstracts of current literature. Having an online journal subscription gives reader's the flexibility for around the clock access to view content in html or to download articles in PDF form to print and read at leisure. In addition, subscribers will have the added benefit of access to all past issues from 1993 to current volumes. Fast-tracked articles (online ahead of publication) are also posted. Through an exclusive agreement with MII, Taylor & Francis is providing a generous discounted annual rate for individual International Branch Members and authorized personnel of The McKenzie Institute. Note: The subscription is for individuals only â€“ excluding institutions, corporate bodies, official or government bodies or agencies and libraries. The online subscription period is for one year from the date of order.